Whenever we get a chance to, we visit the distilleries we purchase our products from. We believe it’s important to work closely together and to benefit from each other’s experience in the absinthe market. Discover amazing photos of great people in prestigious and small distilleries. Back in November 2017, I was contacted by one of my treasure hunters who offered me a vintage bottle of absinthe that was found in the cellar of an ex-hotel located in the south of France (the ex-owners used to travel a lot to unearth unique and rare wines and spirits). The pictures he sent me were not great, but we – Absinthes.com – bought it anyway, knowing that we had never been disappointed by this treasure hunter. Philippe Martin’s absinthe distillery is located right at the birthplace of absinthe, Boveresse in the beautiful Val-de-Travers in the Swiss Jura mountains. The family business is situated in a large, very historic house, “Maison des Chats”, the house of cats. Philippe Martin distills about ten different absinthe brands there. Last week, we had organized an Absinthe Tasting at our local store in Germany with absinthe distiller Gaudentia Persoz. She distills classic Swiss absinthes in the Val-de-Travers, the place absinthe was first invented. Since she is one of the very few female absinthe distillers worldwide, we can with no doubt call her the green Fairy! We’d like to introduce the La Semilla – Aymonier Absinthe distillery in France. Ran by Mayra and Francois Aymonier, the couple has chosen to distill only organic absinthes with herbs that are mostly grown on their own fields at an altitude of about 1100. Today you’ll learn more about the small distillery, Julien’s bond with nature and tradition, and his use of traditional production methods. And most importantly – Julien’s willingness to experiment and innovate – of the 4 absinthes released by Awen Nature, 3 of them use completely innovative plants to give them colour: Saffron, Verbena and something wild and secret Julien would not share with us! In a small town in Sweden, something special is going on. Using wild-foraged and home-grown herbs, made on an absolutely tiny scale, two new absinthes are being distilled: Grön Opal, and Vit Opal are these absinthes. Today we take a first look at these brand new artisan spirits, and speak to the two makers about how they ended up setting out on the grand adventure of starting up a distillery, and some of the hurdles they faced along the way. Back in 2009, two friends, Mikael Norell and Tomas Runnquist, decided to set up a distillery. 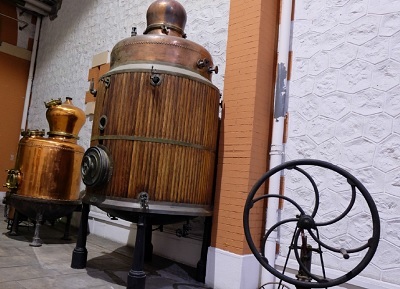 After overcoming many administrative barriers, they ran series of test distillations. In May 2014, the results of their hard work was ready: the recipe for Absinthe Grön Opal and the Absinthe Vit Opal was finalised. In 2015, Absinthes.com made these two absinthes available to people the world over. Today we’ll introduce a Czech distillery to you, specialized in the production of fine, artisanal spirits. The Zufanek distillery is a family business, best known outside the Czech Republic for their absinthe. The best kept secret however is their exceptional liqueurs and eau-de-vies. The family started their absinthe production in 2008, after a lot of trial distillations, research and input from experts. From then on, all the absinthe made by this distillery has been a wonderful success! Josef and Maria Zufanek founded the distillery in 2000, together with their sons (Josef, Martin and Jan). The company’s mission is: to specialize in the production of all-natural spirits and liqueurs, especially Slivovitz, that is, plum brandy. The Pernod distillery in Thuir is located in one of the historic homes of the brand near Perpignan, in Southern France. The distillery is part of Pernod’s factory where Suze, Byrrh and the firm’s wine-based aperitifs, are produced. It was officially opened in October 2013. Pernod began the 2-year long construction of the site after the French law-makers voted to lift the nation-wide ban in 2011.